Feeling overwhelmed by all the investing information flying at you on the internet? Why does it seem like every website related to investing will only give you nibbles of information, then quickly try to sell you into their product or service? I know how this feels, I’ve been there. Trying to find good education on the internet can sometimes be like trying to find a needle in a haystack. I know it took me weeks to learn things that could’ve been taught in 10 minutes. The reason why is that there’s not enough quality investing information on the internet. Too much spam, too many fluffy blog and news articles, and too much selfishness. It’s indicative of our society, and it’s even worse on Wall Street. I am so sick of the condescending gurus and the corrupt, pretentious fund managers. NEWS FLASH: You don’t need an expensive suit, a prestigious Ivy League degree, or a superior understanding of third order partial derivatives to do well for yourself in the stock market. Again, there is a lack of quality investing information. This is the problem nowadays and if it isn’t obvious yet, I’m trying to solve it. Wish someone would take the time to explain aspects of the stock market to you? What about talking to you in plain English, and with visual examples? I did all this in my video tutorial, and there is more to come. What about finding free tools on the internet? So many websites out there want a piece of your wallet. So few are concerned with actually helping you. In the video I use a simple Excel tool to help compare different stocks. I also mention on there that I’m giving it away for free. If you have alot of questions needed to be answered, or just generally don’t know where to start, then this video is for you. I tell you why the P/E ratio is important, and how it’s related to past market highs and lows. Then I show you how to calculate it easily, using my free Excel tool. 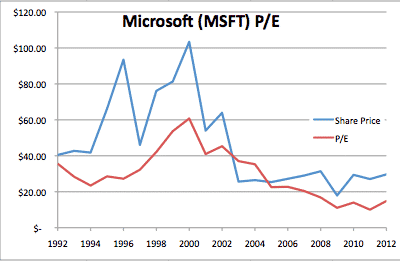 Finally, I show you how Microsoft’s (MSFT) and I.B.M.’s (IBM) stock price related to its P/E ratio dating back to 1992. I’ve created graphs to illustrate this, which make it so much easier to understand. Enjoy the video, and please let me know if you did.